I am very proud to be Canadian, and especially proud to be a serving member of the Canadian Forces. When I first discovered that I had been selected to attend this scholarship study tour, I was filled with excitement and joy. I would finally be able to visit the area where my own grandfather fought, and where thousands of my fallen comrades paid the ultimate price for my freedom. I was not expecting to feel any sorrow. In fact, as soon as I stepped off the plane and my feet touched the French soil, I felt my chest expand with pride. I felt honored to be gracing the same earth as those soldiers who came and went before me. Joining the military is not for everyone. There is a reason why hardly any young Canadians chose to join these days – and that is because it is the most challenging thing you will ever do in your life. It can break you just as easily as it can build you up. You will do things you never ever thought were possible. You will fail in epic proportions, only to be lifted up by your brothers and sisters in arms, who really become your family. You will never feel as true a love, as you do when you realize that you would take a bullet for any one of your section mates and wholeheartedly lay down your life for your friend and for your country, if it was asked of you. This overwhelming sense of pride and honor carried me through the first few days of the tour, preventing me from recognizing the slow encroaching pain and sorrow I was inevitably going to feel. When I first laid eyes on the French cemetery outside of Arras, I felt as though I had been kicked in the stomach by a horse. My initial reaction was pure anger and disbelief. I literally stormed around the entire cemetery, unable to take in the sheer number of graves. I descended slowly into a state of depression, thinking about my own home unit and the guys I have grown up and trained with. Imagining all of us, in a matter of minutes being slaughtered on these slopes was almost too much to bear. I am not a religious person by any means, but I found myself in a very odd spiritual state – cursing the extreme loss of life and praying for all of the souls, especially those in the mass graves, of the fallen men. Many of them were my age or younger. They never got a shot to grow up, go to school, find someone to love, get married, have children. Life was stolen from them. The finality of death was suffocating. I haven’t felt pain like that in a long time. It brought back the persistent ache of loss of losing close friends and family in Afghanistan. I was completely overwhelmed and taken off guard, and was extremely embarrassed that I was having such difficulty reigning in my emotions, especially as a soldier. Thank god for Bruce Moncur, a fellow study tour participant and Canadian soldier. While I cannot recount in this blog post the words that were shared between us, as they are personal and belong only in that space and time, I can say that having a fellow Canadian soldier to talk to about my anger, frustration and pain was exactly what I needed. Thank you Bruce, first and foremost for your service to my country, and second for being the best friend a soldier could ask for. Of course, there is so much more to share, but to be frank, I just don’t even know where to begin – I think I need some more time to process everything I have seen and experienced before publically reflecting on it. What I can share is that this battlefield tour has invigorated me to continue to pursue excellence in my military career, as well as my personal civilian life. As an intelligence operator, it is my job to “clear the fog of battle.” To provide essential and timely information and analysis to the commander so that he can make the best, most informed decisions for the troops on the ground. Mistakes are not allowed. Mistakes cost lives. In both the first and second World Wars, the fog of battle was thick and unforgiving. However, we as a trade have learned from those terrible losses and resounding victories – and are determined to use that knowledge to better serve our combat arms. No one is perfect – but I can sure as hell strive to be, every second of everyday. I owe it to those who died so that I may live, to serve my country to the best of my ability. And when I feel tired and defeated, I will remember the age-old army saying “there’s plenty of time to sleep when you’re dead.” To the thousands of young men buried in the French soil, it is your time to rest. Rest in peace, perfect peace. 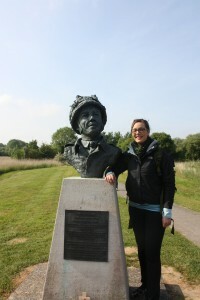 Editor’s note: Lacey Zukewich is pictured above with the memorial to Major John Howard, VC, near Pegasus Bridge.